Walking meditation is common to most forms of Buddhist meditation. It can be done in a variety of ways, ranging from slow to fast, formal to informal. Known in Japanese Zen as kinhin, walking meditation serves in part to provide relief between long periods of sitting. In principle, at least, kinhin also provides a bridge between the stillness of zazen (sitting meditation) and the activities of everyday life. By practicing kinhin, we bring the concentration and awareness engendered by zazen into our bodily movements. Later, we can bring those same qualities into all aspects of our daily lives. Walking meditation, as taught by Thich Nhat Hanh, incorporates the traditional aims of kinhin but adds another dimension, namely that of cultivating a peaceful body and mind. As Thich Nhat Hanh often points out, when we are anxious or filled with anger, we print the earth with anxious or angry steps. By practicing walking meditation, we can be kinder to the earth, and we can also cultivate peace within ourselves. “To lessen the unpleasant feeling brought about by anger,” he observes, “we give our whole heart and mind to the practice of walking meditation, combining our breath with our steps and giving full attention to the contact between the soles of our feet and the earth.” By so doing, we reclaim our calm, allowing us to look directly at our anger and ascertain its cause. For Thich Nhat Hanh, that practice consists of saying “only loving things.” This guideline is easily misconstrued, especially by newcomers, as merely repressing anger or making nice. But as defined in the stern teachings of Thich Nhat Hanh, to practice loving speech is “to say the truth in a loving way, with nonviolence.” It is to “tell the deepest kind of truth,” using “the kind of speech the other person can understand and accept.” Far from being an exercise in avoidance or self-repression, loving speech is a difficult practice, demanding not only a steady mind but also honesty, care, and tact on the part of the speaker. Simply put, we must think before we speak, and we must engage the compassionate heart as well as the analytic mind. In a world scarred by violence and rent by deep political divisions, the integrated practices of walking meditation, loving speech, and deep listening may appear naive, utopian, and far removed from the corridors of power. But such was not the case in September, 2003, when Thich Nhat Hanh came to Capitol Hill to speak at the Library of Congress and offer a three-day retreat. ** Nine members of Congress, eleven family members, and nine clergy attended the retreat, which focused on loving speech, deep listening, and the resolution of conflict. However idealistic Thich Nhat Hanh’s effort may appear, its limited success kindles a spark of hope. Even in Washington, it confirmed, entrenched opponents can learn the practice of peace. *Thich Nhat Hanh, Calming the Fearful Mind: A Zen Response to Terrorism (Parallax, 2005), 63. Subsequent quotations are also from this text. 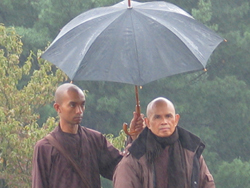 **Thich Nhat Hanh’s retreat was entitled “Leading with Courage and Compassion.” See Washington retreat. Yes, it’s so true, the peace practice is the only way to live in peace. Not talk of peace, documents, books, laws, anything can be os peaceful like be in peace in this everchanging present, always. So it is so difficult to see people to really understand and put in practice this word “peace”, and so much times this reamin only an abstract word. For example all the fact we study in history courses are wars, and stories of violence. Changing the way we look to facts could be important. For example giving more importance to positive fact, to quantum leaps in human history. But this is not we see in this violent and egotic society. I thank you so much for this post. I will read again to meditate onto it again. Thanks for reading, and thanks for your response.